Cuba is the host of this year's International Jazz Day. It's a tradition that began in 2011, when UNESCO, the United Nations Educational Scientific and Cultural Organization, made it a day for celebrating jazz around the world. And joining us now is our favorite jazz guide Christian McBride host of NPR's Jazz Night In America. Welcome back, Christian. CHRISTIAN MCBRIDE, BYLINE: Hey there, Audie. What's happening? CORNISH: Now, I don't want to read too much into this given the thawing of U.S.-Cuba relations in recent times, but do we know why Havana this year? MCBRIDE: I think it's because now that the fog has cleared, you know, I think Cuba was chosen because we can go there now. And Cuba has played such a vital role in American music over the last five decades. It makes sense to have an International Jazz Day in Cuba. You think about all of the great Cuban musicians who have really gotten into the belly of American culture. CORNISH: In what ways? Who influenced who? Who can you think about? 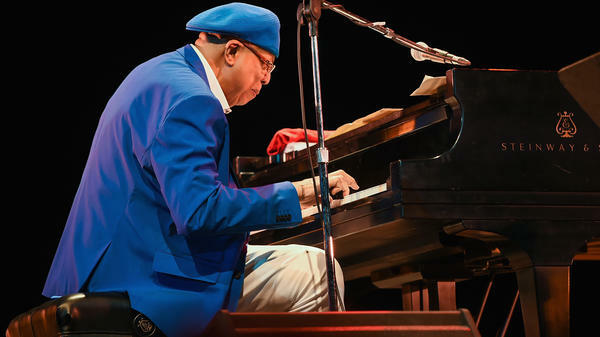 MCBRIDE: Well, you go all the way back to - certainly, from a jazz standpoint, you think of the collaborations of Dizzy Gillespie and Chano Pozo, which was probably one of the most significant fusions, shall we say. DIZZY GILLESPIE: (Singing) Manteca, manteca. CORNISH: And this song is called "Manteca." MCBRIDE: Nineteen-forty-seven. Listen to that - that groove and then Dizzy playing all that bebop on top. MCBRIDE: We think of fusion as some sort of a label that was created in the '70s when young jazz musicians started to incorporate rock sounds into their music. But if you take fusion in its literal sense, that happened at least 30 years before that happened in the '70s. And it started with Dizzy Gillespie and Chano Pozo. MCBRIDE: You know, there's a great documentary, and they interview Dizzy Gillespie. And he's sitting in this chair, and he's talking about the story of how "Manteca" was composed. Dizzy was introduced to Chano by the legendary Cuban trumpeter Mario Bauza. CORNISH: And we should mention that Chano Pozo - he only lived to the age of 33. He died in 1948. CORNISH: He just, like, had this huge role in the founding of what we now talk about as Latin jazz. MCBRIDE: That's absolutely right. And so Dizzy was telling the story about - he hooked up with Chano. And Chano started singing the groove to him (vocalizing). And it was very groundbreaking in that the bass didn't play on the first beat. In all American music up until that point, the bass always played on the first beat just to establish the beginning of the bar (vocalizing). MCBRIDE: You know, even if it was four to the bar, you had to play the first beat. It was just required, you know, particularly, for dance music. So you had a groove that had no bass on the first beat (vocalizing). That was pretty radical at that time. But then you add those drums and all the rhythm that the horns threw in. And Dizzy decided - said, hey, you know, this was a great groove, but it needs something else. So then Dizzy composed the bridge. And now you have one of the first examples of Cuba and America coming together to create a gorgeous baby. CORNISH: I love this. I didn't know any of this history. So I know you actually were in Cuba recently. Can you talk about your impressions of the jazz scene there - what it looks like now? MCBRIDE: I found that there was a lot of rhythm in the street. Even non-musicians were very musical. And I don't think that was just sort of my, you know, getting caught up in a rapture of being in Cuba. I really did find that everyone was melodic, and everyone was rhythmic, you know? So in that sense, you know, it could have been like New Orleans or it could have been like Johannesburg or any city with a lot of rhythm in it. And the actual musicians there are just absolutely incredible. They're very, very well-trained. I know that there've been so many genius Cuban musicians through the years. I just couldn't wait to see who was there who just hadn't come to America yet. And we went there for the Havana Jazz Festival, and I was so excited because, not only did I get to play with my trio, but the great Chucho Valdes asked if I would sit in with his band. MCBRIDE: And so I got to play a couple of songs with Chucho. And the place where we played - I wish you could have seen the theater, Audie. It was about a 2000-seat auditorium, and it was packed. I know they were over capacity. There were people sitting in the aisles. There were people lined up against the side of the walls. People sitting in the pit. And it was just a scene that I've never experienced. You talk about a hometown heroes' welcome - never saw anything like that in my life. So it was a wonderful, wonderful experience to play with Chucho. CORNISH: And you called it a homecoming, but he's in his 70s (laughter) right? Still got it. MCBRIDE: Oh, absolutely. You know, it was just - it was wonderful for me to see how he was worshiped. To see a non-vocalist have that much worship in his hometown - that was really heartwarming to see. CORNISH: You know, Christian, in the end, something like an International Jazz Day allows people to remember kind of certain traditions and get into this history. And I think you've given us a sense of like how important Cuba has been to the jazz scene. But there's one other thing I wanted to ask you about, which was the tumbao rhythm because I know this is something that comes from Cuba and is kind of close to your heart in a way. MCBRIDE: Well, my father was a bassist with Mongo Santamaria's band. So the sound of Cuba has hit me directly, you know, as a kid watching my dad play with Mongo and hearing all - I should say feeling all of these rhythms. I didn't know the names. But one of those rhythms was the tumbao. Hearing my dad play those rhythms with Mongo - that stuck with me forever. CORNISH: Christian McBride is host of NPR's jazz night in America. Thanks so much for speaking with us. MCBRIDE: Always a pleasure, Audie. (SOUNDBITE OF MONGO SANTAMARIA SONG, "SUMMERTIME") Transcript provided by NPR, Copyright NPR. World-class musician and Philadelphia native Christian McBride is presenting his widely acclaimed The Movement Revisited at the Merriam Theater on Saturday, November 21st at 8 pm. WRTI's Bob Craig spoke with McBride about the evolution of the show.